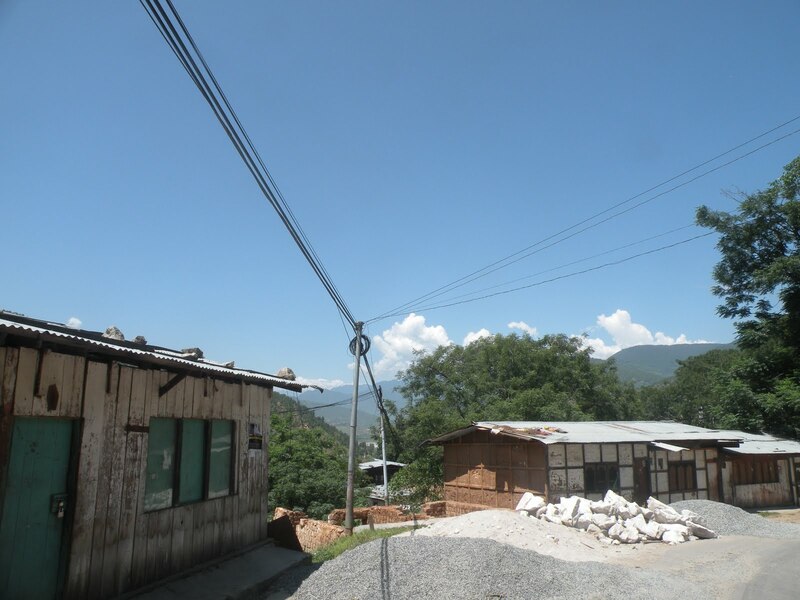 August 31st was the date people in Wangdue were waiting for months with different feelings. But nothing much was happening today besides some closed shops and one lone DCM truck carrying a family's belongings to Bajothang. Official notice has been issued, where it is stated that if any shop is found operating from tomorrow their trade license will be seized. The road to Bajothang, to change the history of a place is going to be rough again. Many structures are half complete. Anything could fall from above and risk the lives of passersby. 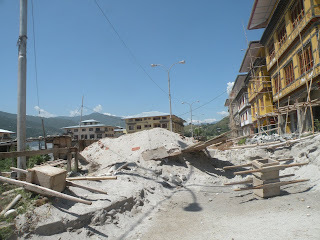 The road network are blocked by construction debris on almost every street thereby making road inaccessible to cars. Sewage from some building are running free on the streets, pollution both land and air. 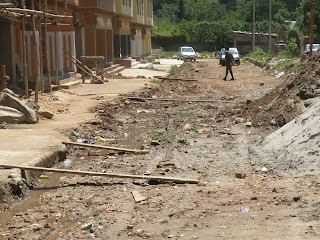 All drainage systems are damaged, and nothing has been done till today. 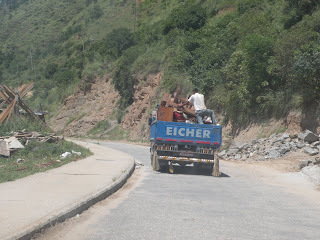 There is not a single traffic signs erected or line drawn on the road, forget the line, there is not blacktopped road visible in the entire town. Streets are filled with cars parked randomly without following any traffic rules. 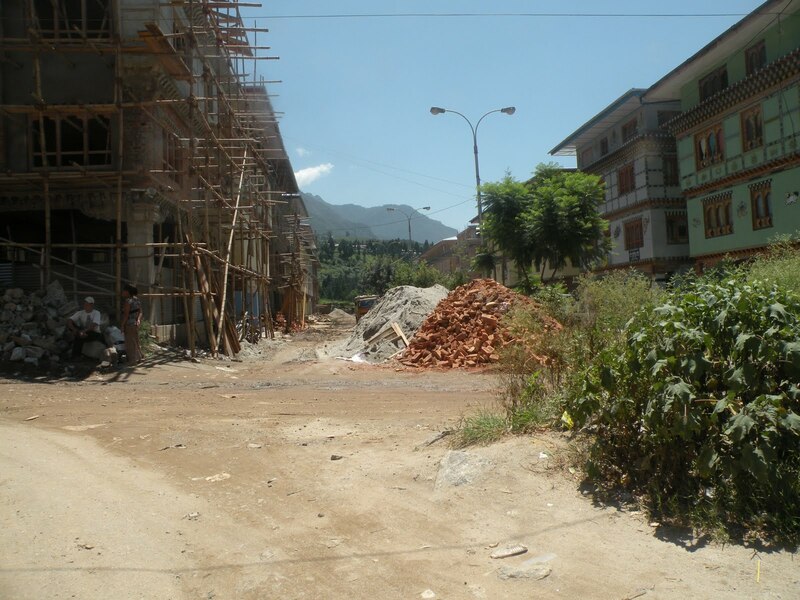 All apartments are filled up, there is no room for people living in Gangthangkha to squeeze in. 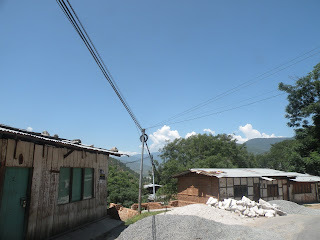 I have toured both the towns this morning and viewed the situation from the eyes of an ordinary Bhutanese who has nothing to lose or gain for whatever happens. I had taken along my camera and captured shots of things to backs the story of what people claim. All the pictures are taken this afternoon, please go through the photostory. This is where Children Park will be. 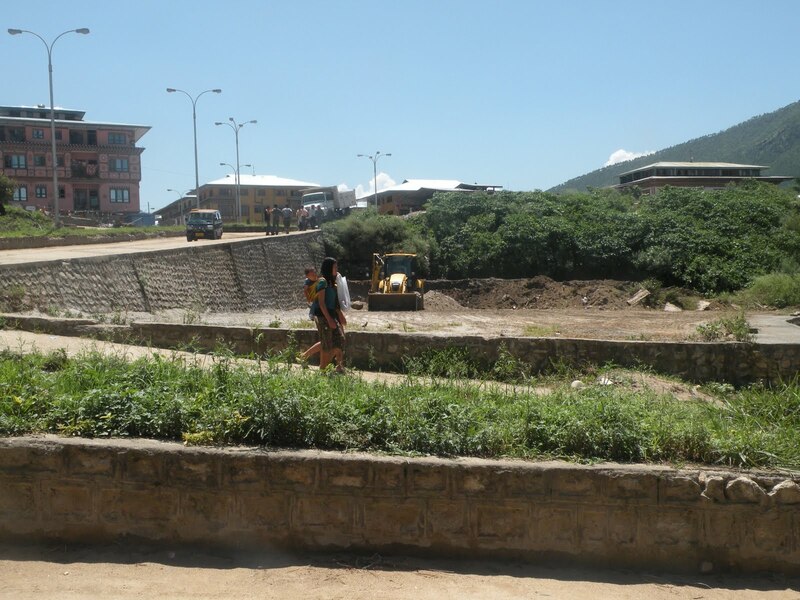 Who will construct it and when is the deadline? The tiny truck parking is being cleared for tomorrow. How many trucks will fit in there? BOD. Why did they have to late for so long. Will they be ready by tomorrow morning? How to get to the other side of the street? Is it a mule track? Forget about traffic signs, you can't even see the road. The bridges you are seeing is constructed over sewage overflow. 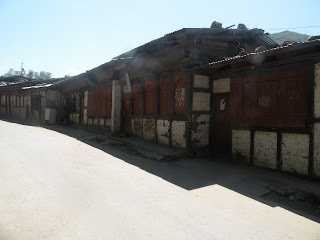 Desolate shops in Gangthangkha, left behind by people who have shifted to Bajothang. So far only two structures were dismantled. 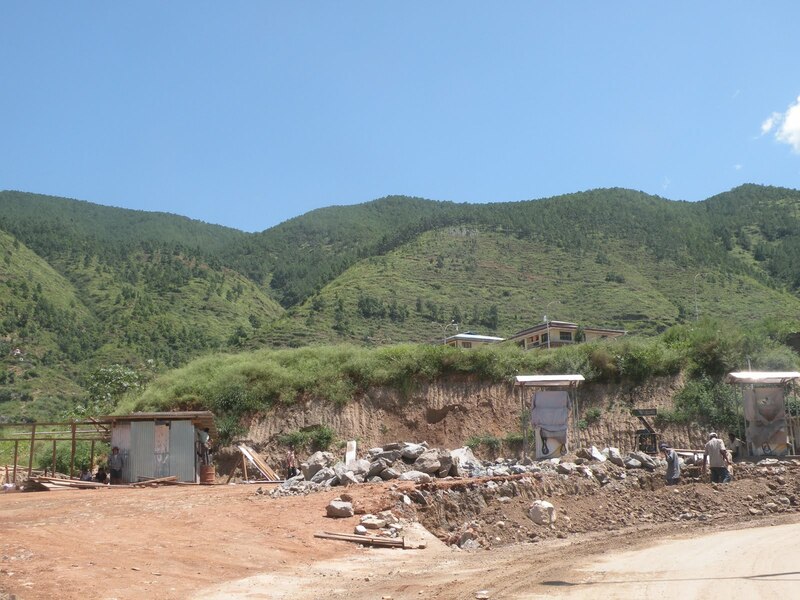 September 10 is the last day for clearing structures in Gangthangkha. Lone truck shifting a home. 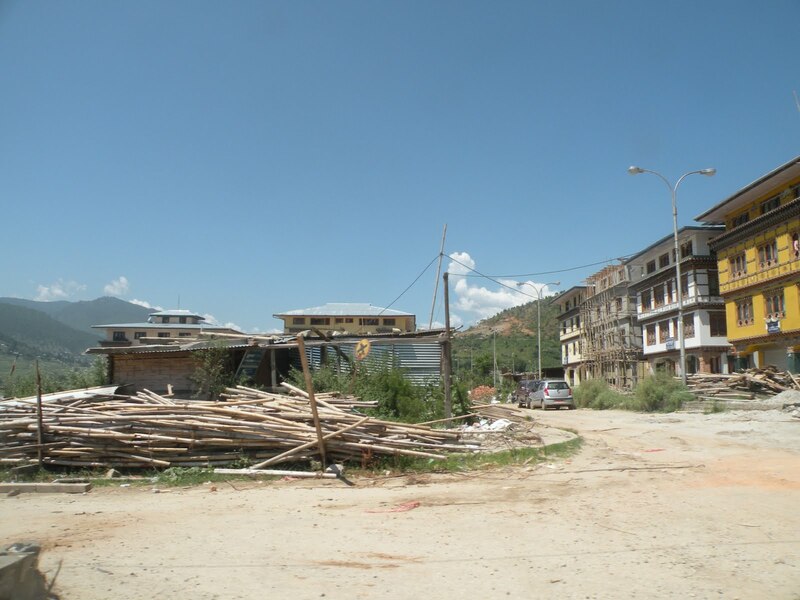 Tomorrow morning when I wake up, Gangthangkha will be no more the place people will crowd. I wish people all the strength it takes to let go the past and embrace the new place, after all Bajothang is a bigger town, with bigger opportunity, with space for bigger dreams. And I wish if the responsible authority could play their role swiftly and give themselves deadline, besides giving to others, in making Bajothang business ready. Thanks for giving the regular updates of my Home Town, passu sir. It seems that both the authorities and the business persons are at fault. By now, the government should have provided with all the necessary amenities in the new town like the BOD, Trafic Signals, proper parking space, Childrens park, etc.., either by constructing themselves or by ordering those responsible (infront of ones own building). It is apparent that construction work will keep going for another few years because many government structures have not laid even the foundation, forget its completion. The business people are at fault because the government have alloted the plots at the same time to every one, and the banks are offering equal share of loan to all people. when somebody could construct, why couldnot others. 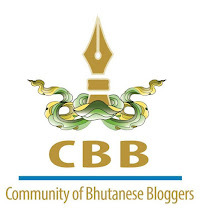 Now comming to the new deadline of August 31st, it is people themselves who set it when the Lyonpo Yeshey Zimba gave the extension, so they should be accountable. 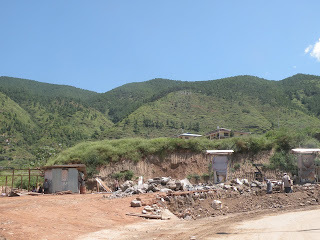 Well, though a concrete jungle, New Bajo town would definitely provide much better services than the old slums of Gangthanka so, next time I go for my vacation, I would definitely love to make a leisurely tour, lols. Poking my nose in between :D I support Leo here. I just wanted to Thank You for updating about the place. I am sire Wangdiphorang is going to appeal so attractive and more like a Sparkling town with lots of shops and people. It was a very informative report Sir. Bajothang town need help as there are many residents living. 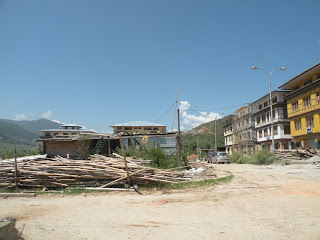 I should say that the town planning was awful: Buildings are also designed awful [Sorry engineers and architects], Roads safty and sewage on the other hand are also awful [However there are few traffic police, I don't know why are they kept in that awful place], all in all I find the match boxes in Gangthangkha was well organised than Bajothang, so call a town! Finally, If I ever see a shooting star I would wish that, 'WAKE UP THOSE CONCERNED AUTHORITIES FOR BAJOTHANG TOWN PLANNING' or 'LET A MIRACLE HAPPEN IN BAJOTHANG'. However all the above words are from a TIRED RESIDENT of Bajothang!